Deriving its name from a locality in the Swiss Alps, tremolite is a member of the amphibole group, a complex series of silicate minerals. It forms in thin, parallel fibers, sometimes producing a distinct cat's eye effect when cut in cabochons. Tremolite comes in a variety of colors ranging from white, brown, colorless, gray, light green, light yellow and pink-violet. 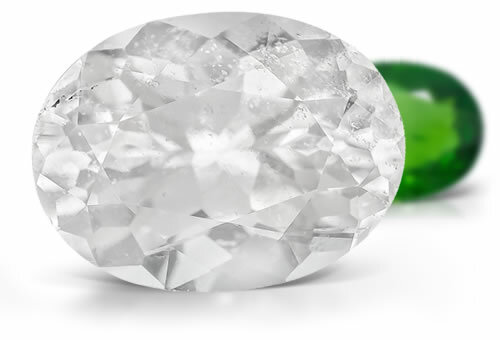 This gem sometimes occurs as fine, needle-like inclusions in emerald and quartz. Chrome-tremolite is the green variety of tremolite colored by chrome. Hexagonite is the transparent pink to lilac pink variety of tremolite. Stones can be chatoyant.